Have you tried this firm, sweet and delicious member of the cod family? 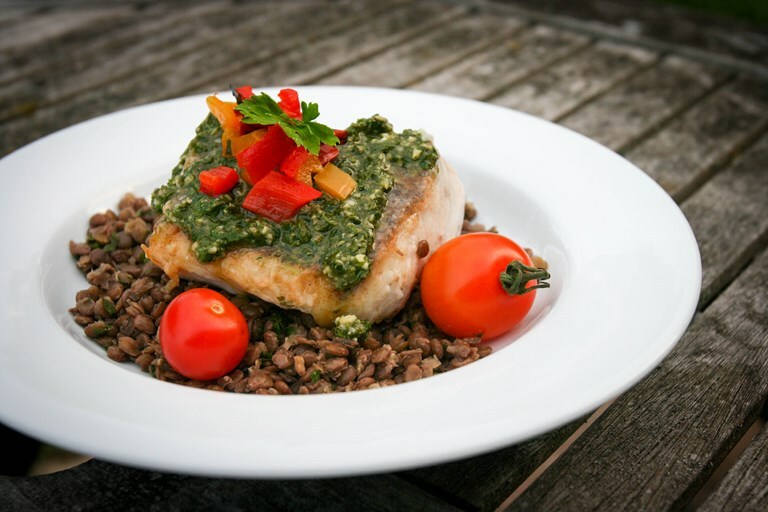 Monica Shaw's easy to make hake recipe, paired with sweet, chargrilled Piccolo tomatoes and a glorious coriander pesto. Hake is a firm, sweet white fish and a member of the cod family. It’s also readily found off the coast of our fine British seashores making it an appropriate choice for the occasion. This week, the particular fillets I was working with were caught in Cornwall. I picked them up from my fishmonger, Ben, at New Wave Fish Shop in Cirencester, who also offered some suggestions on how to cook it. Ben explained that hake is a moister fish so it’s useful to flour it before pan-frying. I could achieve a crispy skin effect by flouring the skin, pan-frying it skin-side down, then finishing in the oven. So that’s what I went for. It was a perfect foil for lemony coriander pesto, augmented with a few beautiful chargrilled Piccolo tomatoes (as a bonus you could add some roasted red peppers, too). I served the hake on top of lentils, but you could also do boiled potatoes or a grain such as pearl barley to make this more of a complete meal.